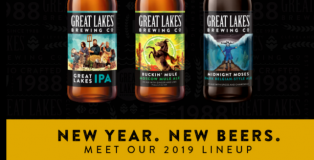 Born in 1988, the 30-year-old independent and employee-owned brewery, Great Lakes Brewing Company (GLBC) has announced its 2019 lineup. Alongside favorites such as Edmund Fitzgerald Porter and Burning River Pale Ale, GLBC unveils its new, year-round Great Lakes IPA, an IPA that honors its employee owners. As well, GLBC has a new cocktail-inspired Buckin’ Mule Moscow Mule Ale, and the Moses Mix Variety Pack, which features Holy Moses White Ale alongside two variants. But, that’s not all. New cans, new branding and new beers highlight the schedule for next year. 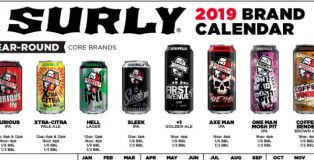 Surly Brewing has announced its plans for 2019, which include (among other items) the return of its Brooklyn Center Small Batch series and Seasonal Variety Packs. The popular Minnesota brewery also announced several new items for 2019 such as boxed six-packs (12 oz. cans) and a new, year-round hazy IPA in 16 oz. cans. Great Divide Brewing is planning to make some significant changes not just to their beer lineup in 2019, but also in their branding and the way they will package their beers. 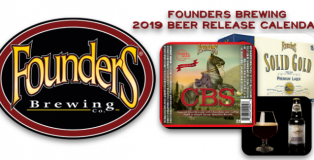 Just as Santa prepares to deliver toys across the globe, Founders Brewing has announced what gifts it has in store for beer drinkers throughout 2019. 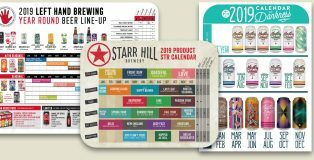 Founders, which recently expanded its distribution to a total of 47 states by adding Colorado, has unveiled its 2019 Beer Release Calendar. 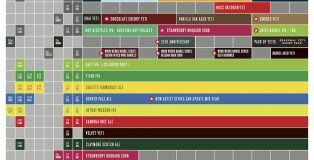 One item that jumps off the page involves the inclusion of its increasingly popular Canadian Breakfast Stout (CBS).